Woodturners love the solitude of wood, lathe and self. We are typically mesmerized while transforming the natural wonders from local and exotic woods into art forms. From novice to expert, from preteen to old curmudgeon, and from all occupations, professions, and walks of life, woodturners are fascinated by the creation of an objet d’art from a simple material such as wood. Though the end products (pieces as woodturners like to call them) come in many forms from simple candle sticks to massive urns made from thousands of small bits stuck together with glue, each piece needs some time spinning on a lathe to be formed and finished. So who is a woodturner? Woodturners are designers, fabricators, technicians, craftsmen, artists and creators. But most of all they are common folk with a passion to just make stuff. 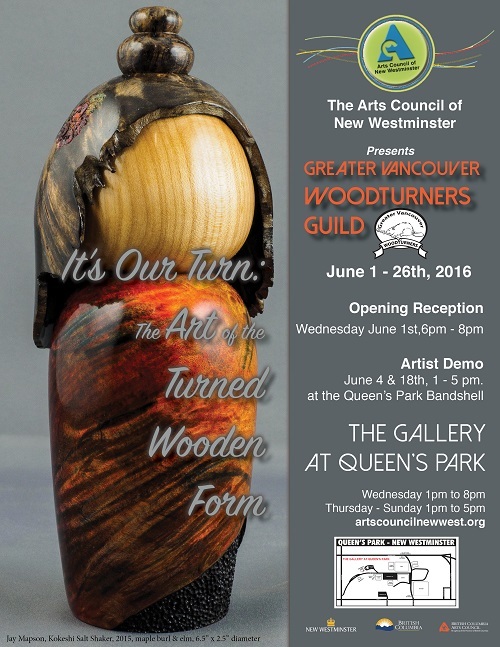 Greater Vancouver Woodturners Guild members have a wide range of abilities and interests and we are very happy to share our woodturning experiences and to assist others in their own endeavours. At meetings, demonstrators teach basic skills on a wide variety of turning topics; a round table discussion offers critique and discussion on finished pieces; and a Tech Talk group provides a chance to discuss technical issues. Monthly speakers present information on turning and related subjects. Periodic seminars, workshops and symposia feature noted national and international woodturners, which is an economical way to learn from some of the best in the world. Finally, we take woodturning to the community in an effort to educate and raise the profile of the art and craft of woodturning.